1. Factor Models and General Definition. 3. Least Squares Estimation (LSE) and Kalman Filtering (KF) for Factor Modeling: A Geometrical Perspective. 4. A Regularized Kalman Filter (rgKF) for Spiky Data. 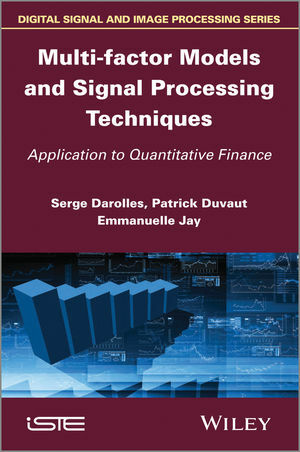 Serge Darolles is Professor of Finance at Paris-Dauphine University, Vice-President of QuantValley, co-founder of QAMLab SAS, and member of the Quantitative Management Initiative (QMI) scientific committee. His research interests include financial econometrics, liquidity and hedge fund analysis. He has written numerous articles, which have been published in academic journals. Patrick Duvaut is currently the Research Director of Telecom ParisTech, France. He is co-founder of QAMLab SAS, and member of the Quantitative Management Initiative (QMI) scientific committee. His fields of expertise encompass statistical signal processing, digital communications, embedded systems and QUANT finance. Emmanuelle Jay is co-founder and President of QAMLab SAS. She has worked at Aequam Capital as co-head of R&D since April 2011 and is member of the Quantitative Management Initiative (QMI) scientific committee. Her research interests include SP for finance, quantitative and statistical finance, and hedge fund analysis. Patrick Duvaut is currently the Research Director of Telecom ParisTech, France. He is co-founder of QAMLab SAS, and a member of the Quantitative Management Initiative (QMI) scientific committee. His fields of expertise encompass statistical signal processing, digital communications, embedded systems and QUANT finance.